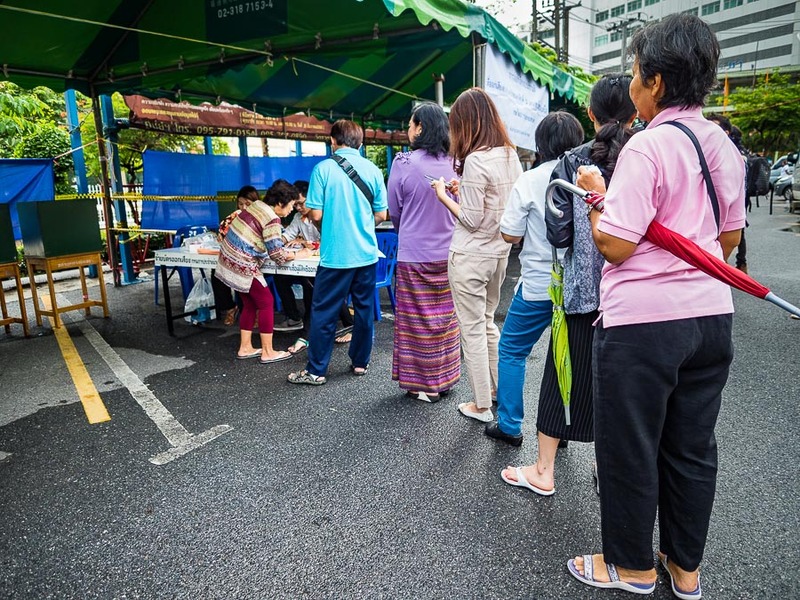 People stand in line to vote on the charter referendum (the new Thai constitution) at their polling place in the Ekkamai neighborhood in Bangkok. Thais went to the polls Sunday in their first national election since the army deposed an elected civilian government in 2014. The poll was a Yes/No vote on the new national charter. There was also a second question about an appointed Prime Minister in the referendum. 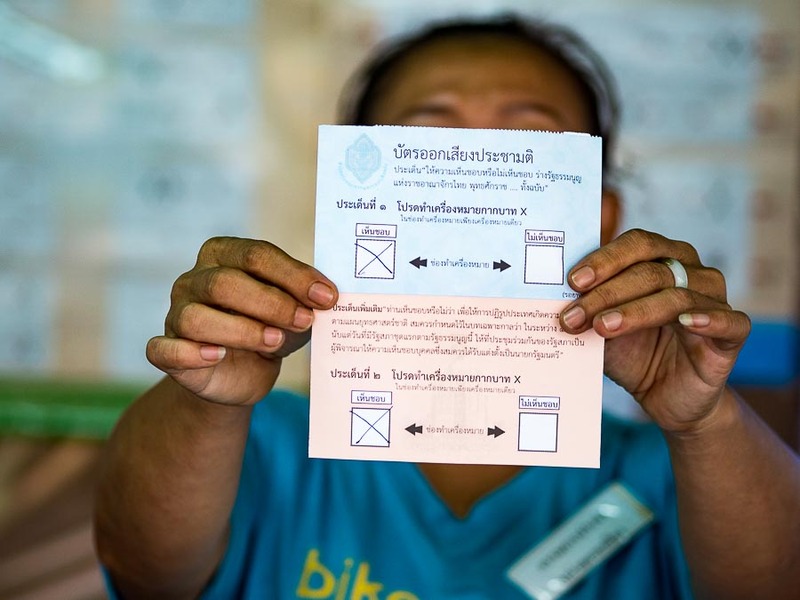 The new charter, Thailand's 20th since 1932, passed with ease - 61.4% in favor, 37.9% opposed. Voter turnout, which was expected to be about 70% was only 55% though. A voter looks for her name on the voter rolls at her polling place. 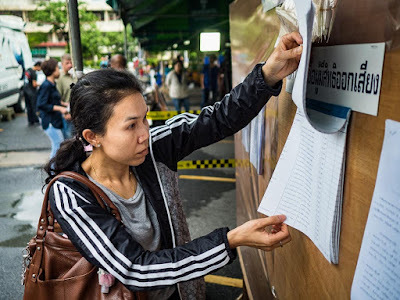 This is the first step in Thailand's walk back to democracy after six months of street protests in 2013/2014 and then a military coup in May, 2014. The military, and military controlled political interests have governed since. I went to five different polling places today (all in central Bangkok). There were some lines early but by midday people walked in, voted and walked out with almost no waiting. There were lots of polling places (I walked to most of them) access was easy and, in Bangkok, transparent. The poll seemed to be transparent and there have been no complaints of vote buying or election fraud. 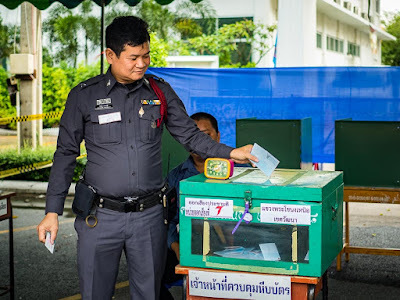 A policeman drops his ballot into the ballot box. Voting lasted from 8AM - 4PM. At 4PM sharp, voting ended (at the polling place I was at) and the vote counted started. Votes were counted at the polling places and the results phoned in to the central elections office. An elections worker holds up a ballot during the count. This was the first step in Thailand's return to participatory democracy. The new charter has been criticized by some because it weakens the power of political parties, makes weak coalition governments more likely and gives more power to the military and bureaucrats. The Senate, the upper house of the Thai legislature, will be appointed rather than elected. There are more photos from election day in my archive and available from ZUMA Press.